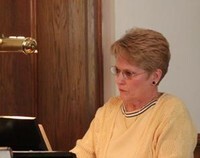 Janet Croel is an accomplished organist and pianist! Her musical talent is a true blessing to every ear that can hear the marvelous notes and chords that her hands and feet play upon the Piano and Organ keyboards and foot pedals. Janet has been a member of the LeValley United Methodist Church for many years and she lovingly accompanies the church choir, worship service and special church services with sincere dedication, devotion and her love for music! Janet and Stephen Croel reside in Ionia. They are the proud parents of children Benjamin and Adrienne, both of whom are also married with children of their own. It is our good fortune and God's blessings that Janet is amongst us!